In this fifth segment of our exploration of the Exponential Curve, we'll consider the diving economy, proliferation of world evangelism and the rapid developments in world politics. 10) The Economy — This brings us to a man-made disaster — namely the out of control spending that has come to characterize the modern welfare state. 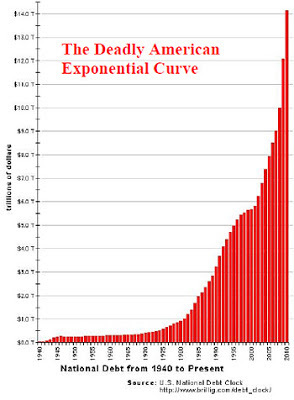 The exponential curve illustrated in the diagram below is leading to the destruction of our nation. In short, our nation is bankrupt, and our economy could collapse any minute. 11) World Evangelism — Not all the exponential curves are bad. Modern technology has made it possible for the Gospel to be preached to billions of people through the use of such media as short wave radio, motion pictures, and satellite television. And, again, this phenomenal development is a fulfillment of Bible prophecy. Jesus Himself said: "This gospel of the kingdom shall be preached in the whole world for a witness to all the nations and then the end shall come" (Matthew 24:14). Incidentally, those statistics are a little misleading because they leave the impression that many people still do not have a Bible in their language. The fact is that the existing translations cover over all the major languages of the world, representing more than 90% of the world's population. The translations currently in progress are for tribal languages spoken by 100,000 or less people. There were 10 million Christians in Africa in 1900. There were 700 thousand Christians in China in 1949. There were 50 thousand Evangelical Christians in Latin American in 1900. 12) World Politics — The exponential curve also applies to world events. Habakkuk 1:5 is as relevant today as if it were written yesterday: "The Lord replied, 'Look, and be amazed! You will be astounded at what I am about to do! For I am going to do something in your own lifetime that you will have to see to believe.'" I took a Sabbatical in 1987 and wrote a book called Trusting God. Seven years later, in 1994, I took another Sabbatical and completely rewrote that book. The exercise gave me an opportunity to reflect back over the seven years between the two Sabbaticals. I was astounded — even overwhelmed — by the rapid and stupendous nature of world events. The tearing down of the Berlin Wall. The peaceful liberation of Eastern Europe from Communism. The resurgence of Islam and its emergence as the greatest threat to world peace. The sending of 500,000 American troops to the other side of the world to defend a country most Americans had never heard of (Kuwait). The handshake between Rabin and Arafat that has led to Israel surrendering portions of its heartland to the PLO. In 1987 if you had predicted any of these developments, you would have been written off as "nuts." The rapidity of these events and their radical nature is breathtaking. They underscore the possibility of the impossible. And they certainly reveal that man is not in control. In the sixth and last segment of our exploration of the Exponential Curve, I'll explain how vitally important it is to understand just what the curve means to the world. 19) "U.S. Debt Clock," www.usdebtclock.org. 21) Wycliffe Bible Translators, "The Worldwide Status of Bible Translation," www.wycliffe.org/About/Statistics. aspx. 22) Sherwood Eliot Wirt, "A Personal Look at Billy Graham," http://www.ccel.us/billy.ch27.html, page 4. 23) From notes taken by the author. 24) Charles Colson, "How Christianity is Growing Around the World," www.cbn.com. 25) Bible Probe, "The New Church: Miracles and Conversions China and More," http://proregeforum.com/ messages/414.html. 26) John L. Allen, Jr., "The Dramatic Growth of Evangelicals in Latin America," National Catholic Reporter, August 18, 2006, http://neronline.org. 27) Ali Sina, "Islam in Fast Demise," www.faithfreedom.org/oped/sina31103.htm, page 1. 28) The Pew Forum, "Global Christianity: A Report on the Size and Distribution of the World's Christian Population," www.pewforum.org/Chritian/Global-Christianity-exec.aspx, page 1. 29) World Hopper Ministry Travel, "Facts About Missions," www.worldhopperministry.com/why/html. I love the World Evangelism stats. I hope more and more find Jesus soon!